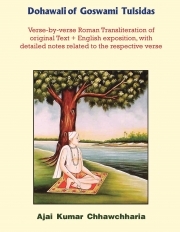 Description of "Dohawali of Goswami Tulsidas"
This Book is a full English exposition of ‘DOHAWALI’, a book of wonderful 573 two-line verses called ‘Dohas’ that had been composed by the renowned 16th century legendary Indian saint-poet Goswami Tulsidas. DOHAWALI has the entire original Text along with its Roman Transliteration that is followed by verse-by-verse English version, and is augmented by notes and further explanations. Since these ‘Dohas’ are stand-alone verses, each distinct from the other and together covering a wide variety of topics, two special indices are provided that help the reader, one at the beginning and one at the end. The first index lists the Dohas according to their topics, and the second index according to selected keywords. This book also includes a life-sketch of Tulsidas along with a list of all the books he had written and a brief note about each of them. The ‘Dohas’ of DOHAWALI are a priceless collection of pearls of wisdom and gems of priceless advice that this blessed saint Tulsidas offers to us as a guide to answer so many questions that arise in our minds and for which we seek a practical answer. The ‘Dohas’ show us how Tulsidas closely observed the world and deductions that he arrived at. They are devotional as well as secular in nature, covering a wide variety of subjects, both mundane as well as ethereal, temporal as well as spiritual. A lot many of these verses are also included in Tulsidas’ famous epic known as ‘Ram Charit Manas’, a narration of the story of Lord Ram that is popularly known as the Ramayana. Ajai Kumar Chhawchharia left home when he was approximately 29 years of age due to an inner call of his heart that told him to devote his life in the service of his beloved Lord God, Sri Ram. Worldly attractions did not enchant him at all. So, he didn’t marry, and after his father’s death he came and settled permanently in Ayodhya, the holy town in India associated with Lord Ram. Presently he works as an honorary manager of a world famous Kanak Bhavan Temple at Ayodhya, and spends his time writing in English so that the world can access the wonderful nectar of metaphysical, spiritual and devotional philosophy that is contained in Indian scriptures for which they are so renowned. His series on 108 Upanishads in English, together with Veda Vyas’ Adhyatma Ramayan & Devi Puran Ramayan, and Valmiki’s Adbhut Ramayan have been published by a reputed publisher of India. Details can be had by contacting the author by email given below. The rest of his Books are in various stages of production. Genre of Writing: Spiritualism, Philosophy, Metaphysics, Religious, Devotional and Theological. (A) (1) The Chariot of God: Dharma Rath; (2) OM and Naad; (3) YOGA—Its Practice and Philosophy according to the Upanishads; (4) Ram Geeta; (5) The Revelation of Creation—as envisioned in the Upanishads; (6) The Pentagon of Creation: As Expounded in the Upanishads; (7) The Triumvirate of Creation; (8) Maya: The Whirlpool of Delusions in Creation; (9) Surdas-Ram Charitawali; (10-a) The legend of Lord Shiva: Book 1 ‘Lord Shiva’s marriage with Parvati’; (10-b) Book 2 ‘Lord Shiva’s Sacred Hymns’; (10-c) Book 3 ‘Shiva’s different names & their significance, Shiva Puran, Upanishads’; (11) the Mahavakyas of the Upanishads; (13) Lord Ram’s marriage with Sita (based on Tulsidas’ books “Ram Charit Manas”, “Janki Mangal”, “Ram Lala Nahachu” & “Geetawali”, and sage Veda Vyas’ book “Adhyatma Ramayan”; (14) “Anthology of Sacred Hymns, Stotras & Mantras of Lord Ram”; (15) “Vairagya Shatkam” of king-sage Bhartrihari; (16) An Anthology of the Sanyas Upanishads. (B) Goswami Tulsidas Series: (1) Book 1- ‘Dohawali’; (2) Book 2- ‘Parvati Mangal’; (3) Book 3- ‘Kavitawali’; (4) Book 4- ‘Janki Mangal’; (5) Book 5- ‘Ram Lala Nahachu’; (6) Book 6- ‘Geetawali Ramayan’; (7) Book 7- ‘Vairagya Sandipani’. More books will be added as they get readied. Postal address:-36-A, Rajghat Colony, Parikrama Marg, P.O.—Ayodhya, Pin—224123, Distt. Faizabad, U.P. India. Self-inquiry in Bhagawad Gita Vol 3. by P.V.S.SURYANARAYANA RAJU. Reviews of "Dohawali of Goswami Tulsidas"